Astrophotographer A. Garrett Evans took this image in June 26, 2015 from Lower Falls in the Yellowstone Grand Canyon. The Milky Way shines in the Yellowstone Grand Canyon in this stunning image. 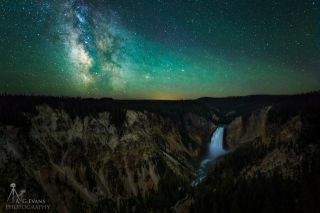 Astrophotographer A. Garrett Evans took this image in June 26 from Lower Falls in the Yellowstone Grand Canyon and shared it this month with Space.com. After taking the image, Evans had a surprise encounter. "On the path just before the parking area we and I bumped into a large bull elk, only about 15 feet away. He was in no hurry so we waited for him to move along so we could get to the car. Bumping into a large animal at night sure gets the blood flowing," he added. The Milky Way, our own galaxy containing the solar system, is a barred spiral galaxy with roughly 400 billion stars. The stars, along with gas and dust, appear like a band of light in the sky from Earth. The galaxy stretches between 100,000 to 120,000 light-years in diameter. To see more amazing night sky photos submitted by readers, visit our astrophotography archive. Editor's note: If you have an amazing night sky photo you'd like to share with our readers and news partners in a possible story or image gallery, send images and comments in to managing editor Tariq Malik at spacephotos@space.com. Follow us on @Spacedotcom, on Facebook and Google+. Original story on Space.com.